On Dec. 5 at 3:25 pm (CLST), Wally Berg, Todd Passey, and Vaughan Barlow made it to the summit of Mt. Vinson! This marks Vaughan’s first ascent of Mt. 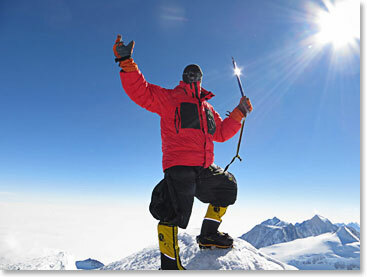 Vinson, and the 5th of his continental high points of the Seven Summits. It is the 17th for Todd Passey and the 7th for Wally Berg. View photo recap part I and part II.